This is my author page. In case you don’t know me I am a Canadian author living in Victoria, British Columbia, Canada. I have attempted to make this site both informative and interesting with an emphasis, of course, on providing an opportunity for visitors to purchase my books. The books themselves are quite different in their nature and thus perhaps their audience, however, I believe that each will provide an enjoyable reading experience and maybe even an unexpected smile—or two. For those who have already read the books you should be able to discover, with a bit of clever snooping, a variety of enlightening information related to each book as well as some very dry and honestly, quite boring details about the author. Click on the book you’d like to know more about and/or order. Newpigin is pronounced as Newpigeon by the locals. Author’s Real Name—Arthur John Stewart—although friends, enemies, psychiatrists and bartenders all call him Jack. One former girlfriend still insists on calling him John. You don’t want to know what players on other hockey teams call him. BTW—If anyone has a really good suggestion on how to get Oprah to hold up Odd Ball or The Newpigin Chronicle during her talk show—even by accident—please email the author with minimum delay—except for spell-checking of course. Author’s Other Books—Exodus, The Green Mile, Of Mice And Men, Sometimes A Great Notion, A Christmas Carol, Lord of the Rings—oh yes, he also owns a signed copy of Katrin Horowitz’s recent book, The Best Soldier’s Wife. 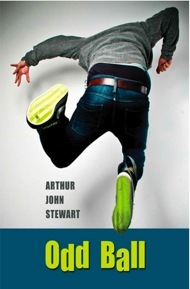 Odd Ball is the first published book written by Arthur John Stewart. 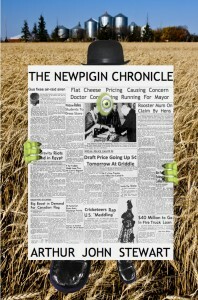 The Newpigin Chronicle is his second. Would The Author Mind Appearing In Person To Answer A Few Questions? It depends. Would he require a top-notch lawyer? If not, then yes, he would certainly be happy to appear in person. He actually loves to answer questions about his books, Odd Ball or The Newpigin Chronicle, about oddball dancing, the rules of Caribbean Three-Card Stud–provincial government version, anything to do with the writing process or the Winnipeg Jets—past or present.